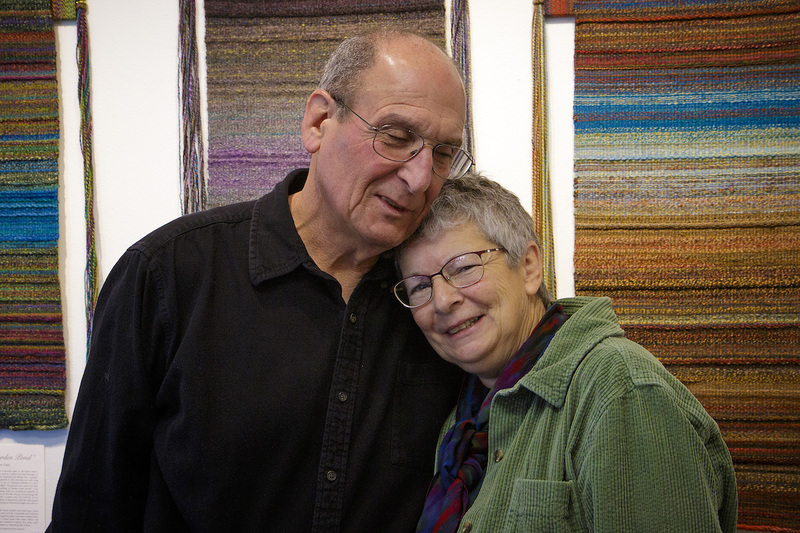 Windwalker Taibe and Mary Jo Oxrieder cuddle in front of Windwalker's wool tapestries. My spirits lift each time I walk into Raven Rocks Gallery at Greenbank Farm. It’s a portal for leaving one’s ego and woes at the door and an entry into a welcoming hearth of art. This month celebrates the tenth birthday of the gallery; an ode to the simple gifts of gracious space and the tangible connection one feels to art made from the heart. 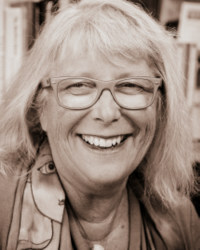 Artists Mary Jo Oxrieder and D.M. Windwalker Taibi, a married couple who took a leap of faith when our economy was crashing in 2008, opened an art space that has since thrived over the past decade. 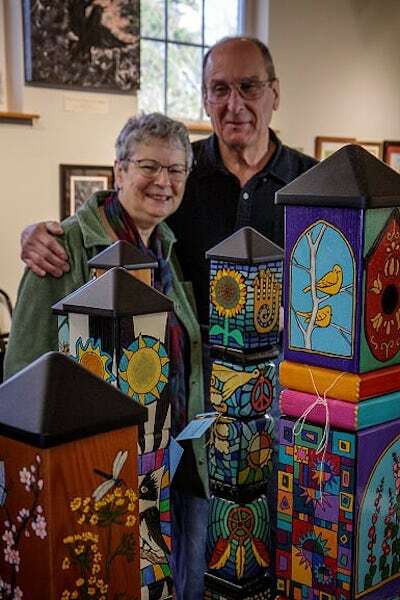 As artists who once worked day jobs before they met, the couple test drove running a tiny closet of a gallery on Langley’s First Street before settling in at the Greenbank Farm. Folk Art Boho Poles by artists Tonah and Tim Potter front Mary Jo and Windwalker at their gallery. A Spokane social worker in her earlier life, she then moved to Seattle in 1996, setting up a life coaching business and working for the Giraffe Heroes Project in Langley. Before he met Mary Jo, Windwalker was living in Ohio, making art and working at a day job. He was an educator on the East Coast before that time. 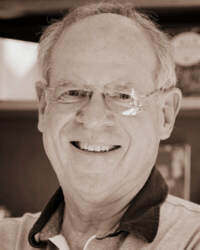 The two met through an online spiritually-oriented dating website in November 2002. It was kismet, they say. They moved to Whidbey Island in 2003. Fast-forward to learning to run a gallery in 2007. But the space had limitations, Mary Jo said. Logistics required visitors to leave one part of the gallery and walk into another and it was difficult to know where to place art to be best seen. By 2008 the couple weren’t sure they wanted to continue with running a gallery. The economy was beginning to unravel and many Langley galleries suffered in the wake of uncertain times. Mary Jo and Windwalker spin yarn from artisan hand-dyed fleece that is sold in skeins. Surprisingly the rent at the farm fit within the couple’s budget and they took that as a good sign to begin a new venture. They came in a month ahead of time and painted the walls the color they wanted. The lease started November 1 and the response was positive. 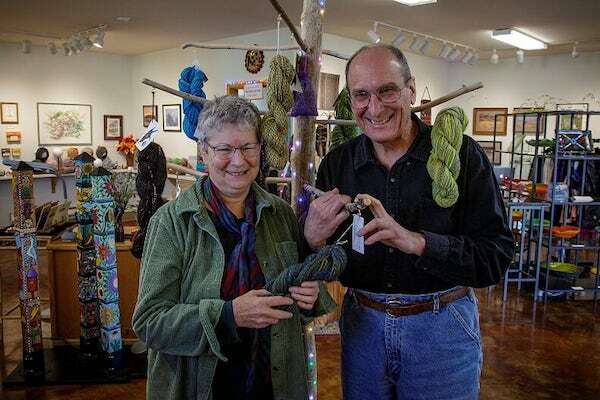 The gallery opened the same weekend Whidbey Weavers Guild held their annual Uncommon Threads fair at the Greenbank Farm barn. Making friends with the weavers, Windwalker, especially, was interested in new techniques for weaving wool tapestries. The couple found they enjoyed working with wool. Nowadays they acquire hand-dyed fleece from fiber artists and spin it into skeins of yarn sold at the gallery. Some of the wool is used for Windwalker’s tactile tapestries or Mary Jo’s hand knit hats. Windwalker also makes jewelry and pens whimsical prints of bearded ravens with hearts. Mary Jo creates a Fantasy House series, sold as prints; along with batik fabric Lucky Fish, Soft Hearts and Scrumbles—little whimsical characters of fabric that remind one of the lighter side of life. She likes when items find her and speak to her imagination and creativity. For the gallery’s tenth anniversary, Windwalker created a series of paintings based on winter, recalling his boyhood memories of stark trees, wind, birds and winter sky in the Ramapo Mountains bordering New Jersey and New York. A mix of watercolors and black ink, the prints evoke the winter winds in this collection of mixed media artwork. Wonder why the gallery is called Raven Rocks? Over the years, the couple formed a close community at Greenbank Farm. 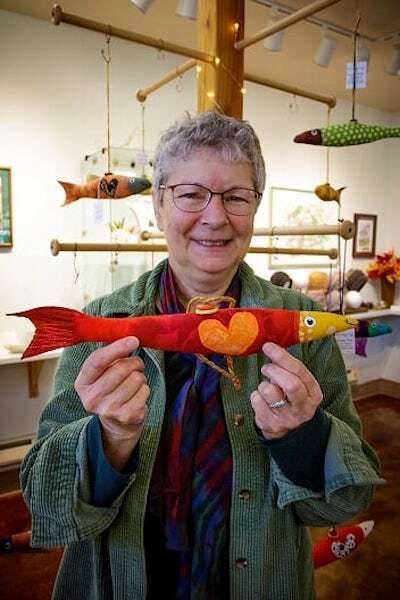 Mary Jo’s whimsical Lucky Fish soft art. 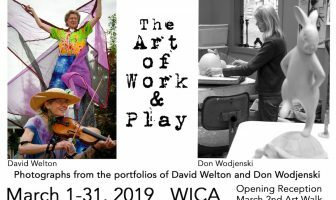 As self-proclaimed introverts Mary Jo and Windwalker say they like the gallery’s intimate setting which cultivates talking with visitors one-on-one. Many of the visitors are locals who return again and again. The secret to their success is creating a welcoming space with art they love making and inviting a dozen other renowned and emerging artists whose art reflects a similar level of happiness in the making. And over the years the gallery has thrived. Visit the Raven Rocks Gallery at 765 Wonn Road, C-101 in Greenbank. Long overdue story on this dynamic duo! Thanks, Kate & David!!! Thanks, Drew! Glad to hear we were able to do a service for this talented and sweet couple!